I get questions from my clients frequently asking me if I can paint their laminate furniture. Yes I can! And you can too! Let me show you how easy it is to do. Laminate furniture is incredibly budget friendly and available readily at big box stores and always for sale in groups and local selling sites. It's just not always appealing to the eye. With a few easy steps you can completely customize it to your decor. This desk started as a dark brown laminate hollow core piece. A friend of mine wanted it painted and customized to use as a table for her shop in trade shows and markets - these are the perfect pieces because they are lightweight and easy to move around. 1. Clean! I use a TSP solution (I mix the powder with warm water) to give it a good scrub. Make sure to give the piece a wipe down with clean water to remove any residue left from the TSP. 2. Sand! We need to give the piece a little tooth for the paint to adhere to, so I gave it a good scuff with 150 grit sandpaper. I really like these - they last longer and are easy to use. 3. Clean again! Give the piece a good vacuum or wipe down with a damp rag to get rid of the dust from sanding. Because we created a bondable surface for the paint with our prep steps, there is no need to prime first. You can start painting now! 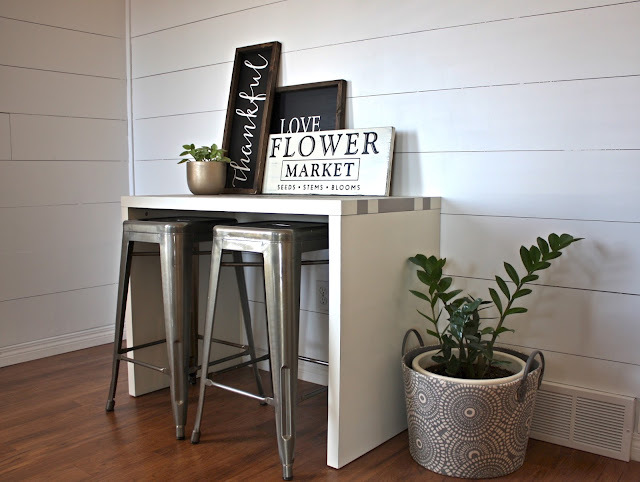 My go-to for anything needing high durability is the All-in-One formula from Country Chic Paint. Hands down, this is my absolute favourite paint. This formula adheres like no other and is very durable - a must have on your paint shelf! I gave the entire desk two coats of Vanilla Frosting. When the paint was fully dry, I taped off the stripes with blue painter's tape and painted them with a coat of Hula Hoop - a lovely warm grey from Country Chic's limited edition line earlier this year. When the stripes were dry, I gave the whole desk a light sanding. 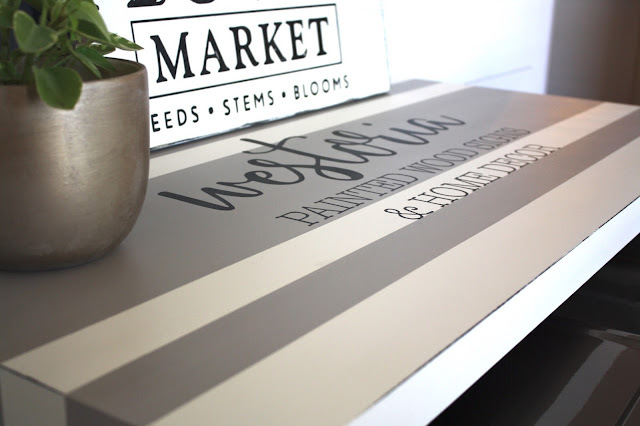 I used Liquorice from Country Chic Paint to paint on the logo for her shop. The All-in-One formula does have a topcoat built in, which is very durable. However, a piece like this that is going to be very highly used can benefit from added protection. I added two coats of Tough Coat. There you have it! 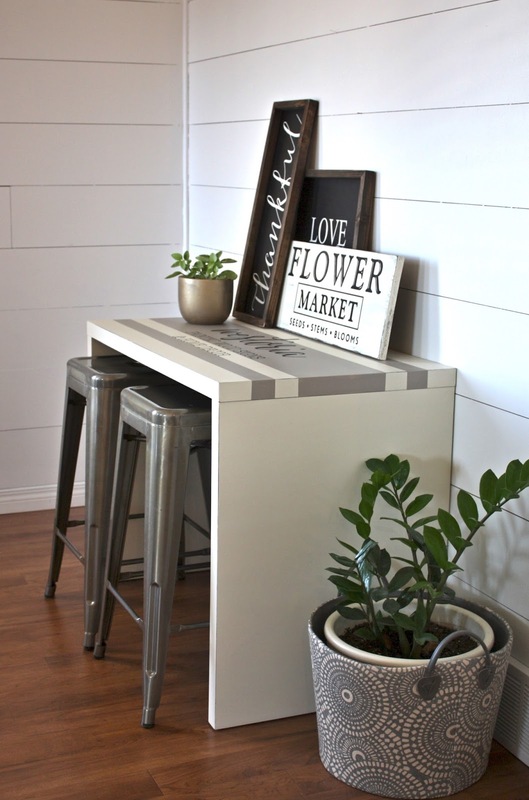 Laminate furniture can be painted, easily! If you have pieces like this in your home that you're tired of and need a new look, why not paint them?